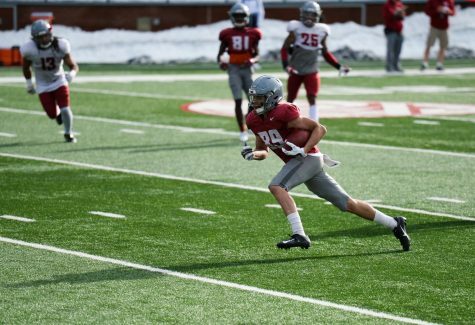 Freshman quarterback Cammon Cooper looks for an open pass, shortly before throwing a touchdown pass during the WSU Crimson and Gray football game Saturday afternoon at Joe Albi Stadium in Spokane. 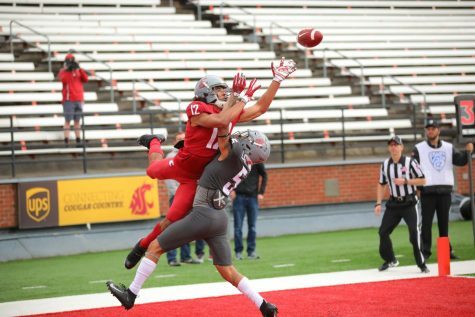 It was an Air Raid kind of day at the Crimson and Gray game in Spokane on Saturday as both offenses exploded for a combined 428 yards through the air in the first half. The Crimson team defeated the Gray 34-24. 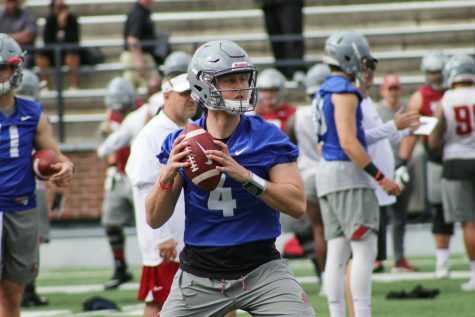 Leading the Crimson was redshirt junior quarterback Trey Tinsley, and for the Gray it was fellow redshirt junior quarterback Anthony Gordon. 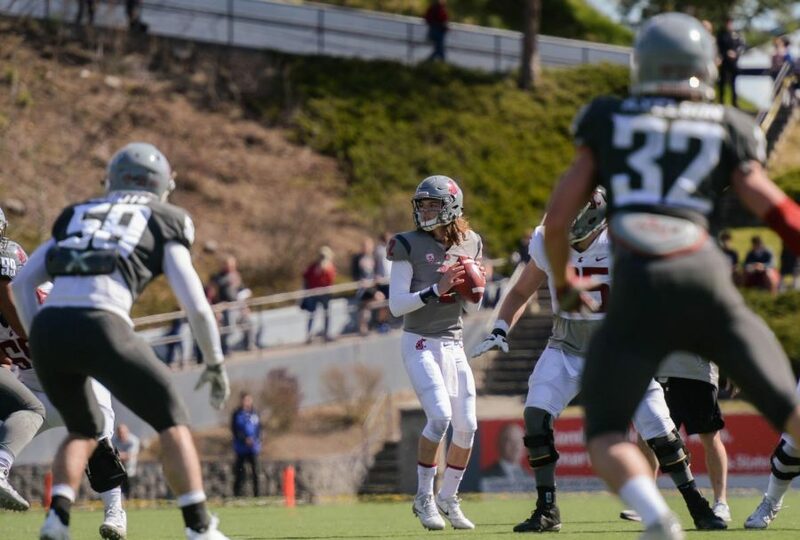 Head Coach Mike Leach was impressed by the play of both quarterbacks. Both quarterbacks facilitated the offenses with adequate efficiency. To start the day, Tinsley and the Crimson team paraded down the field for a quick six points. Tinsley began his performance by fitting a third-and-long pass in between two defenders to find senior wide receiver Kyle Sweet for his second of eight total receptions on the day. That would set up a four-yard touchdown to redshirt sophomore Renard Bell, capping off a 75-yard drive to open the game. 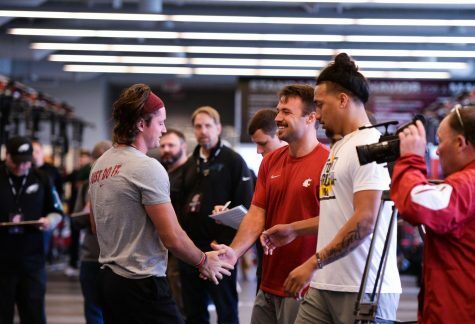 The Crimson team’s second drive saw the longest play of the day by way of a 62-yard throw-and-catch from Tinsley to Sweet, which set up a one-yard score on a slant route to Spokane native and freshman wide receiver Rodrick Fisher. Tinsley finished the day with his third and final drive, where he completed all seven of his passes for 62 yards and a touchdown. Tinsley spread the love in his final drive, finding Sweet for his eighth reception of the half, redshirt junior wide receiver Easop Winston Jr. twice and redshirt senior running back Keith Harrington for a 10-yard score off a shovel pass from Tinsley. On the Gray team’s first drive, Gordon would lead his side to their own score. Gordon didn’t show off his surgically precise throwing that he has demonstrated throughout the spring, but he got the ball to his playmakers and allowed them to do the rest. 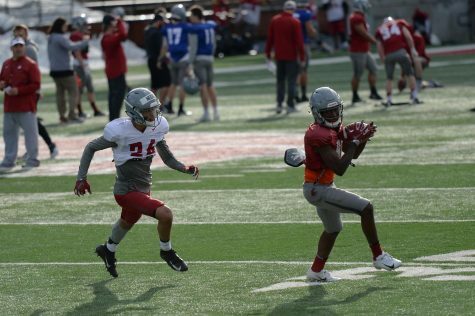 A 36-yard screen pass to redshirt freshman wide receiver Travell Harris put the Gray team in the redzone, and a pass-interference penalty would set them up with a first-and-goal. With the end zone three yards away, Gordon handed the ball off to freshman running back Max Borghi, who barreled his way in for a touchdown and the only rushing score of the afternoon. The ensuing drive for the Gray team featured junior wide receiver Dezmon Patmon and all the physical tools he has to offer the Cougars. Patmon reeled in two catches of 20 yards or greater, one of which resulted in a touchdown, the other on a post route over the middle of the field. Between Tinsley and Gordon, the Cougars tallied four touchdowns, 387 passing yards and not a single turnover. Toward the end of the first half, freshman quarterback Cammon Cooper took the field, much to the approval of Cougar fans in attendance. However, Cooper, who Leach said dealt with some pregame jitters, struggled to find a rhythm. Cooper orchestrated back-to-back three-and-outs before picking up a first down. 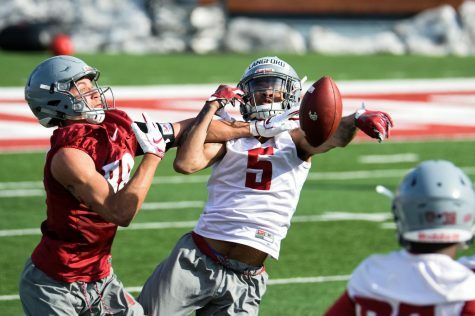 Cooper wouldn’t provide much production until the fourth quarter when he found redshirt junior wide receiver Kainoa Wilson for his only touchdown throw of the day. On the drive, Cooper completed four of his six passes for 65 yards. On the defensive side of the ball for both teams, several players found individual success, but as a unit they struggled to prevent big plays in the first half. Claeys said he did not mind the fact that his defense did not force a single turnover in the first half, but the miscommunication resulting in big plays was frustrating. 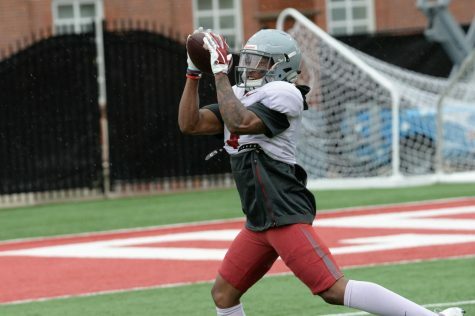 The only interception of the day came from an ill-advised pass from redshirt freshman quarterback John Bledsoe, which was taken the other way by redshirt freshman defensive back Armani Marsh. 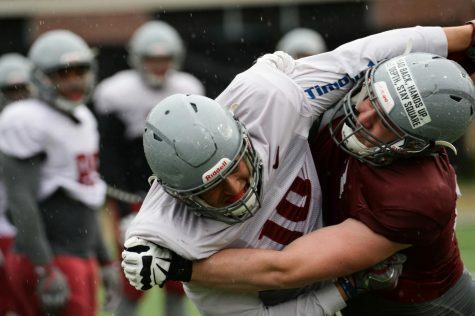 In the trenches, Leach took a liking to the performance of redshirt junior defensive lineman Nnamdi Oguayo, who Leach claimed to have seen in the backfield all game. Oguayo was among five players to record a sack in the game. 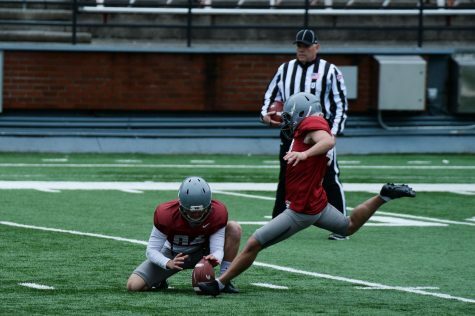 When the clock at Joe Albi Stadium hit double zeros, the Crimson team led the Gray team by a final score of 34-24. Then fans were invited on the field for autographs and pictures with the team and coaching staff. 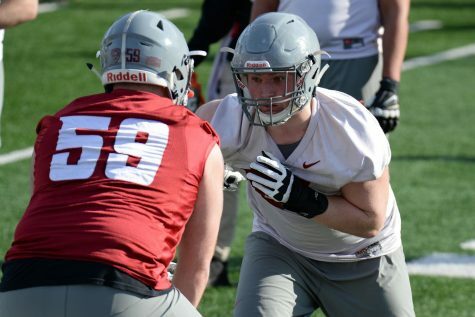 The Cougars will conclude spring practices at 2:30 p.m. Tuesday at Rogers Field and Martin Stadium.